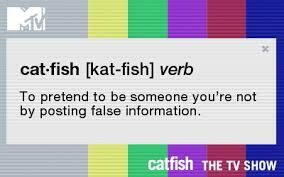 To “catfish” is for a person to engage in an online relationship on the basis of lies about parts or all of who they are. With no government law or authority to appeal to, victims of catfishing find themselves in a situation akin to what philosophers call a state of nature. The television show Catfish illustrates the social difficulties created and made possible by social media. The settings created for the smooth functioning of social media only allow users to block or ignore others: they have the ability to withdraw from interactions and are left with only words when it comes to affecting the behaviors of others. They cannot prevent anyone from posting comments about them, from impersonating them, from using someone else’s pictures to create a fake profile, or, once they have been confronted, from catfishing someone else. The goal of Catfish is to help hopefuls – persons who were in an online relationship and believe they might have been catfished – meet the person who has been eluding them. But the show also seeks to stop catfish from creating new profiles and fooling more people. Just as in the state of nature, there is no authority that is able to determine what is socially acceptable behavior, let alone enforce it. Legal debates in the 1990s showed that there is much resistance among the population to giving governments the authority to regulate online behavior. In the early modern era, the philosopher Thomas Hobbes advocated transferring our authority to a sovereign ruler, who would make decisions in our place in exchange for security. This option does not seem to be viable online. The philosopher John Locke offered a milder alternative: transfer our right to punish others to a force that will spare us the efforts and the danger of taking matters into our own hands. But even Locke’s vision is too intrusive in the eyes of those who resist policing cyberspace. Catfish thus fills a need, helping to set things right in the online state of nature: it deals with individuals who create chaos in existing relationships and make it difficult to create new ones. Rather than responding to a hopeful, in episode 12 of season 4, the show follows Falesha, whose pictures were being used by a woman named Jacqueline not only to catfish other people, but also to impersonate Falesha and harass others, leading her peers to keep their distances from her. Falesha explains how her attempts to ignore or confront Jacqueline failed and were turned against her, how she was accused of bullying others and lost her friends, and how she was worried about the effects her alter ego had on others, some of whom lived in different states and were being violently bullied. Jacqueline’s social media profiles would be removed, and she would create them again. Because of the improbable character of Jacqueline’s interactions with Falesha’s peers, it was difficult for them to believe that Falesha was being impersonated and to trust Falesha at all, leading her to wonder what might make her efforts at creating new relationships worthwhile. The philosopher David Hume rejected the idea that anything like a state of nature ever existed, or that it was helpful to think in such terms. Instead, he advocated that when laws do not or should not exist to punish those who cause harm to others, shame should be used as a social tool for policing. As the reunion episodes of Catfish show, Hume would be at home online: catfish and hopefuls alike are the targets of scorn and ridicule from the viewers of the show. Discussions about whether online news media ought to have comments sections show how far this desire to shame others into the desired behavior can go. Hume advocated that shame and guilt be used in an open social context where there would also be consequences to abusing this recourse. Participants on Catfish, though, are inundated with tweets ridiculing or attacking them. Following episode 17 of season 4, where Hundra was unmasked as having coordinated a fake catfishing episode in order to appear on Catfish, a reunion episode in season 5 showed the fallback for her actions. Some of the tweets sent to Hundra or to the television show about Hundra read: “You need a smack in the mouth,” “You are nothing,” “#Hundra = nasty attention seeking tramp,” “Hundra kill yourself.” Other messages she didn’t even open because of what she feared they might contain. Hundra decided to appear on the reunion show to further explain her reasons and show viewers that she hadn’t deserved the treatment she received. Catfish responds to the reality that although the practice of catfishing is widely known, it has not stopped. After all, as we interact online, we also become easier to fool. The anonymity that online interactions allows encourages us to imagine others as we want them to be, as we fill in the information we lack. That same lack of contact with them in our everyday life leads us to accept what they tell us about their own lives. And without everyday matters to attend to, like the need to make plans, to select places and times to meet, to compromise on our preferences, we are able to talk about other matters more freely and to develop a different kind of intimacy than is possible face to face. We are consequently more willing to accept what they tell us and make excuses for inconsistencies. Catfishing takes this logic to its limits: over months and sometimes years, catfish are able to maintain a relationship based on lies about who they are because those they catfish want to believe what they are told, or because they value the online persona and the intimacy they can have online with that person. Catfish tells the histories of relationships where this intimacy develops quickly, often following a difficult moment or traumatic event in the life of the hopefuls. Catfish rely on the need for trust and intimacy they see in others to develop a real bond and in most cases, they also value this bond. Some even come to prefer being the persona they have created to being the person they are offline. Likewise, the hopefuls who ask for help from the television show are aware that they have actively participated in their own catfishing, taking away some of the responsibility from the catfish. Catfish: The TV Show attempts to help those who suspect that a person with whom they are in an online relationship is lying to them about who they really are. One of the hosts, Nev Shulman, by documenting his experiences with such an online relationship in the movie Catfish, coined the term “catfish” along with his co-filmmakers to describe a person who cannot be seen and who forces others to stay alert, lest they be harmed. Catfish is more than “gotcha” journalism. Nev Shulman and his co-host Max Joseph seek to understand the motivations behind fooling others and behind believing others, in order to establish a line of honest communication in spite of the harm that has been caused and the mistrust that has been created. The success of the show hinges on the sympathy Nev and Max clearly feel and display toward both parties, and the distance they maintain toward them as they attempt to discover the truth about their motivations. Unlike Hobbes’ sovereign or Locke’s police, Nev and Max are not entrusted with the capacity to make decisions on behalf of the catfished, nor to punish the catfish. The outrage and indignation they sometimes display at the actions of the catfish, often aimed at convincing them not to harm others in the future, have more to do with reparation than with retribution. The emotion they display is closer to what the philosopher Jean-Jacques Rousseau called pity or sympathy. Nev and Max are compassionate, and they appeal to the desire that is usually present in both persons in a relationship to also be compassionate. Contrary to Hobbes and Locke, Rousseau believed that before society, we are good. We feel pity for others when they are in danger or when they are suffering; we feel sympathy for others as we can help each other survive the hardships of life. But, Rousseau thought, when we live among others long enough we lose this natural feeling of pity and become vain. Our vanity blinds us to others’ suffering and makes it possible for us to make them suffer, so that we may look superior to them and be more highly regarded. The emotions of self-love and self-interest then trump the emotions of pity and sympathy that would allow for peaceful relationships. Rousseau thus argues that any kind of agreement with others ultimately depends on our capacity to focus on the common good, that is, what is good for us as well as for everyone, rather than what is only good for us. To learn to see the common good might be the motto of Catfish: The TV Show. As soon as Nev and Max contact the person seeking their help, they display compassion for their difficulties. Once they meet them, they seek to establish a mutual relationship of trust so that they can truly help. Ultimately, they are being asked to intervene on behalf of the catfished, in a manner that would be consistent with how they would act if they felt they could do it themselves. Yet Nev and Max do not stand in for the hopefuls: they are not simply authorized to act in their name. As mediators, they are able to show compassion to the catfish as well as to the catfished. Because they haven’t been hurt and because they have no bond to the catfish, they are able to talk with them calmly and to get them to open up. Just as we discover early on what traumatic events led to the hopefuls to crave intimacy and trust so much that they could be catfished, we also discover what events in the lives of catfish led them to deceive others. In the exchange between the catfish and catfished, both discover their similarities, the feelings of the other, and the dependence of the other to their relationship. Both discover how alike they are, what each got out of the relationship, and that a truthful relationship would be good for both of them. Such an exchange is only possible because both have been able to discuss their relationship with someone who showed them compassion and did not seek retribution, but rather a reparation of a relationship in which they had no stake. Whether a new relationship is created beyond the existing online relationship is another matter entirely. The person in front of both persons is different than the person they knew online. At the conclusion of each episode, Max and Nev contact the participants to get an update. Outside of a few exceptions, who give accounts of their life that contradict those given by the other participant or who refuse to be contacted again, we see participants have their lives bettered by their encounter with Max and Nev and with the person with whom they had been in a relationship. Max and Nev teach them – and us – that people are capable and worthy of compassion. Trusting others is worth the risk. Randee and Jérôme Melançon studied philosophy at the University of Ottawa. They have taught it at the University of Alberta Augustana Campus in Camrose, Alberta. Now they use it to justify themselves in the face of the world while living in Regina, Saskatchewan.